Vaughan’s Pub has been in the family for over 300 years. The Barn where we hold our weddings was converted from a coach house in the mid 1980’s and makes for a unique and memorable wedding venue. The Barn was fully converted in 1991 and has been used for set-dancing ever since. It is popular with locals for holding family celebrations and in the last few years has been used to great success as a unique and alternative wedding venue. We look forward to sharing your wedding day with you & working with you to put your own unique signature on your special day. The Details All you need to know. As well as our sit-down menu, we also cater for BBQ’s & Buffet style wedding food. Kilfenora Hostel is located right beside the pub. There are a great range of B&B’s as well as self–catering accommodation in the village and surrounding area. There are also hotels located in the neighbouring towns to Vaughan’s and we can provide an accommodation list for your guests. Transporting your guests to and from The Barn can be made easy with local bus companies providers. We are located in Kilfenora, Co. Clare in the beautifully rugged west coast of Ireland. Kilfenora is a historic village located near the sea in County Clare. It is a gateway to the fabulous landscape of the Burren, with its limestone walls, high crosses, cathedral ruins & old style facades which are within a stones throw from the pub to make your wedding photos extra special. 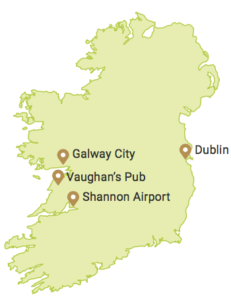 We are also located close to great transport links with Galway City & Shannon Airport less than an hour away. We also have numerous famous tourist attractions close to the pub. Here is a selection of food available for your wedding day. As well as our sit-down menu above, we also cater for B.B.Q and Buffet style wedding food. Nearly all requests are catered for! We use local suppliers as much as possible and with The Burren on our doorstep we can be spoiled for choice. Our menu can also be designed if you are having a day after party. Prices vary on menu choice and can be discussed when suits you.